Pakistan has reportedly launched a fresh probe to determine the actual volume of assets and deposits of organisations like Lashkar-e-Toiba and Ummah Tameer-e-Nau and their associates. China today dissociated itself from donning the role of a peacemaker between India and Pakistan and hoped that the upcoming visit of Premier Zhu Rongji to New Delhi would serve to dispel the fears of a ‘China threat’ and enhance mutual understanding. British Prime Minister Tony Blair has briefed US President George W. Bush on his South Asia tour, including India and Pakistan in the wake of the tense stand-off between the two neighbours. Four Israeli army soldiers and two Palestinian militants were killed early today in a gunbattle in the southeast of Rafah town in southern Gaza Strip, Israeli and Palestinian sources reported. 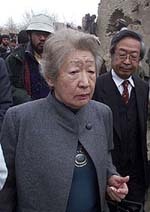 Former United Nations Refugee Agency chief Sadako Ogata (C) visits Estafil village, near Kabul, on Wednesday. Ogata, visiting the country as Japan's Special Advisor on Afghanistan, said on Wednesday she was optimistic for the future of Afghanistan but the country still had a long road towards normalcy. U.S. Senate Foreign Relations Committee chairman Joseph R. Biden will meet Indian Prime Minister Atal Behari Vajpayee on a mission to “calm the incredibly dangerous situation” in South Asia. Mr Biden left on a multi-faceted trip to Afghanistan, Pakistan and India. Zimbabwe’s ruling party, dismissing possible suspension from the Commonwealth, moved on Wednesday to ram through legislation which critics fear will muzzle opposition and the media as President Robert Mugabe seeks re-election. Hundreds of Afghans crammed into a draughty cinema in Khairkhana district for a cinematic experience that would test the stamina of even the most ardent moviegoer. Frustrated by the less than $1 million tapped from bank accounts of listed terrorist organisations in Pakistan, the authorities are reportedly launching the probe into their deposits and assets. A report in Jang, a daily, said officials feel groups like Lashkar, one of two Pakistan-based organisations that India blames for the attack on its Parliament, cannot be run on such meagre sums. Jang, quoting unnamed official sources, said the fresh probe was not limited to tapping their assets and accounts but has been extended to the alleged financial links and investments made through frontmen and organisations. Having acquired details of bank accounts probed under the instructions of the State Bank of Pakistan last month, the relevant authorities are said to be launching the investigations afresh for determining the actual volume of assets and deposits of the organisations linked to the LeT and UTN. Hundi, or money laundering, experts and property dealers doing business in transactions of large sums of money from abroad and inland, plus the sale of houses and ranches, inland and abroad, are suspect recipients of these amounts. In this connection, sources said, investigators have received details of money transacted through “hundi” agents in a number of countries and in Pakistan. Financial intelligence experts in the USA and a number of European and West Asian countries have compiled these details, they added. The Federal Investigation Agency and bank officials are reportedly being deputed to carry out these probes while property and hundi agents will be approached in Karachi, Lahore, Peshawar, Islamabad and a number of other cities, the paper said. Pakistan froze the assets and bank accounts of LeT and UTN, a day after such a ban was imposed on them by the USA. Meanwhile, President Pervez Musharraf faces a tough battle if he is to rein in radical Islamic groups even though their strength lies more in noisy protests than in popular votes. The need to do battle has intensified since General Musharraf — a key ally in the war on Afghanistan’s fundamentalist Taliban — has become the target of international calls to tame home-grown fundamentalist groups after an attack on India’s Parliament. Still reeling from the pressure of British Prime Minister Tony Blair’s shuttle mission in the region, the President received a tough message from US President George W. Bush — clamp down on the extremists. But buoyed by the failure of the hardline groups to win popular support against his decision to join the coalition against the Taliban in neighbouring Afghanistan, General Musharraf may be up for a showdown. And the military leader said on Monday that his country rejected all forms of terrorism, for the first time dropping the term “freedom fighters”. Can these radical groups, whose cadres include veterans from Afghanistan’s holy war, or jehad, against the 1979-89 Soviet invasion and from over a decade-old insurgency in Kashmir, hit back? “They cannot retaliate because their weakness has been exposed during their agitation against the government’s support for the international coalition against terrorism in Afghanistan,” said Khalid Mehmood, senior researcher at the Institute of Regional Studies in Islamabad. “I think the role that can be played by China together with the international community is to persuade the two sides to continue to exercise restraint. However, in the end, it is up to the two countries to find a peaceful solution,” Director-General of the Asia Department of the Chinese Foreign Ministry Fu Ying said. Soon after his return from the six-day trip to Bangladesh, India, Pakistan and Afghanistan, Mr Blair had a 15-minute telephone conversation with Mr Bush last night. “They discussed the current situation in India, Pakistan and Afghanistan following the Prime Minister’s visit to those countries in the last week,” Mr Blair’s spokesman said. Mr Blair’s trip to the Bagram airport near Kabul on Monday night made him the first western leader to visit Afghanistan since the fall of the Taliban, he said. Donald Anderson, Chairman of the Foreign Affairs Select Committee, hailed Mr Blair’s trip as a success, saying that tension over Kashmir threatened world peace. The Taliban defence and justice ministers and several other high-ranking leaders of the ousted ruling militia have surrendered to the new Afghan Government but been allowed to go free and will not be turned over to the USA, a Kandahar commander said today. Mr Jalal Khan, a close associate of Kandahar Government Gul Agha, told the Associated Press that they had met officials in the Kandahar Government and received general amnesty after recognizing the new interim administration in Kabul, headed by Prime Minister Hamid Karzai. Israeli radio’s Arabic service sources reported that two Palestinian militants, wearing military uniform, attacked an Israeli army position near Gaza airport, east of Rafah town, in southern Gaza Strip early today. Palestinian sources reported that the soldiers and the militants clashed in a fierce gunbattle for a while near Kibbutz Karim Shalom on the green line between the Gaza Strip and Israel. 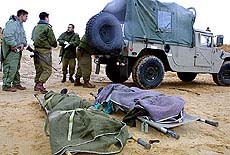 Three Israeli soldiers were killed and four others were wounded. A fourth Israeli soldier died later of his wounds at Soroka Hospital in Beer Sheva. The sources said two Palestinian militants, wearing military uniforms, were killed in the gunbattle with the Israeli soldiers. It is the first time that armed Palestinians have killed Israeli soldiers in the Gaza Strip since the speech of Palestinian leader Yasser Arafat that called for stopping all armed and suicide bombing attacks against Israel. BEIRUT: The Palestinian militant group Hamas claimed responsibility for a pre-dawn raid in southern Israel on Wednesday in which gunmen shot dead four Israeli soldiers before being killed themselves. “There has been a bold attack on a position near Gaza airport, in which four enemy soldiers were killed,” Hamas politburo head Khaled Meshal told a political rally in Beirut attended by Muslim politicians and clerics from across West Asia. “Two were martyred (in the raid). The brethern have just informed me that the Qassam Brigades (the military wing of Hamas) have claimed responsibility,” he said. He later identified the gunmen as Imad Rizq and Mohammed Abdel Ghani al-Jamoos. JOHANNESBURG: South Africa will host talks between senior Palestinian and Israeli officials as part of international attempts to forge peace between the two sides, the Foreign Ministry said today. “The meeting will be hosted by President Thabo Mbeki and attended by officials from both sides,” Foreign Ministry spokesman Ronnie Mamoepa told newsmen. The three-day meeting, which will be attended by former and current South African ministers, will try to restart a stalled peace process and help break a cycle of violence in the region. U.S. Senate Foreign Relations Committee chairman Joseph R. Biden will meet Indian Prime Minister Atal Behari Vajpayee on a mission to “calm the incredibly dangerous situation” in South Asia. Mr Biden left on a multi-faceted trip to Afghanistan, Pakistan and India. He will be in India January 14 and 16, and in Pakistan January 9, 13 and 14. On the eve of his departure, Mr Biden said he wanted to find answers to some difficult questions during his trip. “How can the USA use its influence in Islamabad and New Delhi to calm an incredibly dangerous situation between two nuclear adversaries? “Is President Pervez Musharraf genuinely committed to fulfilling his pledge to hold elections and moving Pakistan toward democracy? These are just a few of the questions I want answered.” Mr Biden is expected to meet with the American troops as well as top government and military leaders in the region during his visit. “I want to see for myself what the dangers are to our men and women in uniform and the effectiveness of the multinational force working to assure that humanitarian aid is getting through (in Afghanistan). Mugabe’s ZANU-PF party used state media to order its parliamentary members to attend the chamber to pass a public order and security Bill that would give the government wide-ranging powers against the activities of its opponents. The move is expected to raise the stakes in a new war of words with former colonial ruler Britain, which said on Tuesday it would push for Zimbabwe’s suspension from the Commonwealth if it did not tackle political violence and human rights violations. ZANU-PF members were summoned to Parliament a day after the government suffered an embarrassing setback when the opposition Movement for Democratic Change (MDC) temporarily blocked Mugabe’s plans to steamroll through a section of the legislation. The MDC managed to win a majority in a vote on Tuesday on the so-called General Amendments Bill after MPs from ZANU-PF, which holds 93 of the 150 seats, failed to attend in sufficient numbers. “The government wants to downplay its defeat but effectively they cannot bring the bill back to parliament during this current session,” MDC spokesman Learnmore Jongwe told newsmen. “In the event of them trying to force it in we will no doubt have to seek the interference of the courts,” Jongwe said. The Bill, which failed to pass on Tuesday, aimed to ban local independent monitors from the March presidential elections.